Another long day, this time from Powell, WY up and over the Bighorn Range, and then through Wyoming to Spearfish, SD. The two main stops were Medicine Wheel high up in the Bighorns and Devils Tower. I do realize my postings on this trip have been short and superficial, but keep in mind that I'm doing them in a motel room at the end of long days! I will write more about many of these sites later this summer. The Bighorn Medicine Wheel is located in the Bighorn National Forest in north-central Wyoming, at an elevation of almost 10,000 feet on Medicine Mountain. Its elevation makes the medicine wheel inaccessible much of the year due to snow pack. The wheel is made simply of locally gathered rocks. From a central cairn (pile of stones) of about 10 feet across and 2 feet high, 28 spokes radiate out to a rim of about 80 feet in diameter and 245 feet in circumference. Six smaller cairns are spaced along the rim. The Bighorn Medicine Wheel is astronomically aligned: four of the outer cairns line up with the rising and setting sun of the summer solstice, and the others with the three bright stars that fade as the sun rises on summer mornings: Aldebaran, Rigel and Sirius. 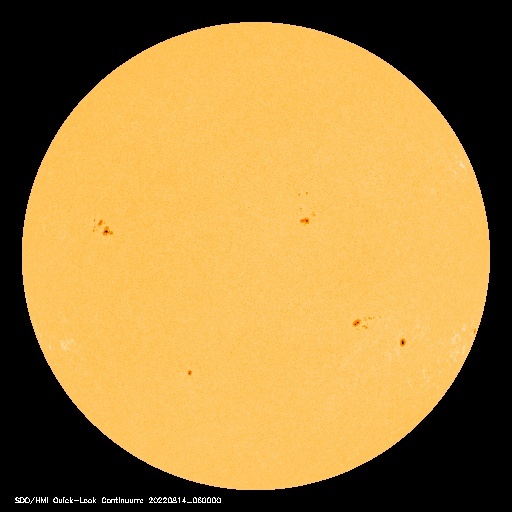 The 28 spokes are likely to correspond with the days of the lunar month. I'll write more about this site later since it's fascinating to me given my interest in archaeoastronomy. We've been to Devils Tower a few times already, but we did stop again because the kids like seeing the prairie dogs. We also just spend a bit of time lounging on a rock in the ponderosa pine forest watching birds wheel over the top of the tower. By the way, I personally hate the name "Devils Tower" - a name probably given simply because the Lakota (Sioux) and other tribes held it as a sacred place. They called it Mato Tipila which means Bear Lodge - a much more apropos name. Falling behind on my posts. Days are long as we try to maximize everything and I'm exhausted by the time we get to our hotel for the night. On Sunday, we drove from Helena, MT (I could live in Montana - it's a beautiful place) down into the north entrance (Mammoth Hot Springs) of Yellowstone, through Yellowstone, out the east entrace (Sylvan Pass), and then past Cody to Powell, WY around 11:00 pm. It was our third time to Yellowstone but still hard to leave since it's such an incredible area. This time we visited Mammoth Hot Springs (not much water flowing there), walked around the Norris Geyser Basin a bit, did a ranger program at Canyon Village (and viewed Yellowstone Falls), and then drove down through the Hayden Valley (wildlife galore). Hard to believe this is the site of one of the largest volcanoes in the world! In the morning, we spent a couple of hours doing an educational program with the kids at the Royal Tyrrell Museum in Drumheller, AB. An educator led us on a short 3 km walk out to an area where she explained a bit about the geology (too low level, even for kids, in my opinion, but we're one of those weird homeschooling families that often uses adult-level educational material with the kids). Many of the remains are from the herbivore Edmontosaurus - later we walked to one weathering out of the a layer but deemed too difficult to collect because it's in ironstone which is difficult to separate from the bone material (and they have plenty of specimens anyway). Also present in the area is Albertosaurus - a T. rex. type theropod (bipedal meat-eating) dinosaur. After lunch, we had a long drive down to Helena, MT. Tomorrow is Yellowstone. We had to leave beautiful Banff today (I'd love to spend more time there but it's a bit expensive). On the way out, we visited Lake Minnewanka and surprised to black bears feeding. Then it was out of the Rockies and down to the prairie. As we passed north of Calgary it was very odd to see hundreds and hundreds of almost identical houses packed in literally six feet apart from each other and surrounded by thousands of acres of prairie. It's like developers bought a few acres of land and then competed to see how many houses they could jam into the smallest area possible. Here's a satellite view in Google Maps (zoom in to see how closes the homes are jammed in there and then zoom out to see Calgary and the surrounding farmland). I found it very odd. Our goal from the day was the Royal Tyrrell Museum in Drumheller, AB. Drumheller is in the Alberta Badlands, an area of primarily Cretaceous-aged rock (near the end of the time of the dinosaurs in the Mesozoic Era) chock full of dinosaur fossils. The exhibits at this museum were amazing in their preparation and presentation. Here's an example of a T. rex fossil partially excavated from the rock slab in 3-D. The information presented on the exhibit signs was excellend too. A full page of information about each fossil interestingly written and informative. Evolution was a central theme throughout the museum as well (some museums shy away from it since it offends some people). I've visited the New York City Museum of Natural History, the Field Museum in Chicago, and the Smithsonian in D.C. (among others), but this museum in the middle of nowhere (over an hour north and east of Calgary, AB) ranks right up there with them in it's dinosaur and history of life exhibits. Highly recommended, even if you have to drive many miles out of your way to see it. Tomorrow morning we signed up with the kids for a program called DinoSite! - a 90 minute hike in the Badlands with museum staff (unfortunately, my kids are still too young for the actual dino digs). Today we drove from Revelstoke, BC to Banff, AB on the Trans-Canada Highway (Route 1). The road goes through Glacier National Park, Yoho National Park, and Banff National Park - Several hours of driving through the most amazing mountain scenery on the continent. The whole day was just spend looking around as we're driving and going "Wow - look at that!" Pictures simply can't capture the scale of the scenery. We did take a couple of short walks - in a temperate rain forest with giant 500 year old cedars on the west side of Glacier National Park, a giant skunk cabbage and Equisetum swamp with abundant bear sign (they like the skunk cabbage flowers evidently), and the area around Lake Louise and Moraine Lake in Banff. Lake Louise and Moraine Lake are incredibly beautiful areas. We also saw some wildlife - a moose crossing the road which was too quick for us to photograph and a black bear foraging. Oh yeah, we were almost killed as well. In Glacier National Park, we were coming down a very long hill and they were stopping cars for a construction zone. We were the second car stopped and suddenly the construction guy starts screaming "Move, move, move!" and was backing up as fast as he could (he had one leg and a crutch but moved very fast). I glance in my rearview mirror and see a tractor trailer barreling down at a high rate of speed right for us. Luckily I moved the car away quickly enough as the runaway truck missed us by inches. Truck couldn't stop for another couple hundred feet down the road. No one was hurt but it was close. Makes you appreciate life when you narrowly escape tragedy like that. Other than that it was a good day. The view from our hotel balcony in Banff was pretty nice as well. Back on the road again on June 23. Left Seattle in the morning, drove north into Canada near Vancouver, and then east across British Columbia mostly on the Trans-Canada Highway (Route 1). Spent the night in Revelstoke, BC. One place we did stop was Coquihalla Summit Recreation Area along BC-5 for a short walk to a place called Falls Lake. An incredibly beautiful place. Also saw a bald eagle very close. He perched on a nearby tree, swooped down to grab a fish (missed), and then flew away. Tomorrow we head to Banff, Alberta. Now this pisses me off. I'm in Seattle, the heart of the Cascadia subduction zone where the potential exists for huge earthquakes, and every at home in the Hudson Valley of New York feels one on June 23. Not that I want to experience a magnitude 6+ earthquake, especially in someplace like downtown Seattle where it will be incredibly devastating, but I've never really felt one with one exception. Many years ago, when living in Albany, NY, I was laying in bed when I thought I felt a jolt. Didn't think anything about it until later when I got onto the computer and saw there was a small earthquake in the northern Adirondacks. The 5.0 magnitude earthquake on Wednesday 1:42 pm EDT was located 35 miles NNE of Ottawa, Canada and felt hundreds of miles away. It occurred 12 miles down in the crust in an area called the Western Quebec Seismic Zone, an area of deep ancient faults that formed hundreds of millions of years ago and are periodically reactivated by stresses within the crust. Northeastern earthquakes, unlike western earthquakes in places like California, are typically felt over much larger areas because the deep basement crust in the northeast is more intact and the seismic waves can propagate easier. In the western U.S., the crust is heavily fractured and the waves attenuate and weaken with distance more quickly. Highly rated professors are worse teachers? A study at the U.S. Air Force Academy showed that professors in classes like Calculus who were rated highest by students actually may not have been teaching their students as effectively since the students didn't fare as well in subsequent classes. The findings are, to say the least, counterintuitive. Professors rated highly by their students tended to yield better results for students in their own classes, but the same students did worse in subsequent classes. The implication: highly rated professors actually taught students less, on average, than less popular profs. Meanwhile, professors with higher academic rank, teaching experience and educational experience -- what you might call "input measures" for performance -- showed the reverse trend. Their students tended to do worse in that professor's course, but better in subsequent courses. Presumably, they were learning more. I don't think it's countrintuitive at all. Students hate it when professors push them. They're most happy when the class is an easy "A" The problem comes when they reach higher-level classes that require prerequisite knowledge they never learned. Still, the popularity contest of student ratings continues to be used by college administrators to assess the effectiveness of their faculty. Basically here in Seattle for a week helping get my brother-in-law's house ready to rent or sell since he's moving to Manhattan next month. I won't post too much about traveling until we start on our trip back. Finally made it to Seattle (we're staying at my wife's brother's house for a week). Spent most of the day at Mount Rainier National Park. The lower elevations of the park were in the upper fifties with intermittent sun but the higher elevations were overcast and cold with 10 feet of snowpack! Today we drove from Grants Pass, OR (on I-5) over the Coast Ranges to US-101 near Coos Bay. US-101 is the scenic highway that runs up the Pacific coast. Weather along the coast was alternately overcast and partly sunny, incredibly windy, and around 58-60 F.
Here's a picture of a tree along the coast. It grew in this manner due to the constant winds off the ocean (they're called "flag trees"). The coast was beautiful but nicer to view from inside the car! The main stop we made today was Sea Lion Caves, a commercial operation located at the largest sea cave in North America and which is host to a large colony of Stellar sea lions. The visitor's center is located 200 feet up on top of a basaltic sea cliff. There's a walkway which overlooks some rocks far below where the sea lions hang out and then an elevator down to the cave where you can view the sea lions on the rocks inside. The roar of the waves and bellowing of the sea lions echoing in the cave is incredible. A few pictures (both outside and in the cave). After a few more stops along the coast, we drove back inland to Portland and are spending the night in Vancouver, WA (just over the Columbia River from Portland). Today didn't work out quite as planned. The idea was to drive from Susanville, CA up through the Lassen National Forest and over to Lava Beds National Monument north of Mount Shasta on Forest Service Road 49. Problem was, after driving 30 miles up Forest Service Road 49, we discovered it was blocked by snow (a sign at the start of the road would have been nice). We did, however, visit a few lava beds in the area (erupted within the last few thousand years) and even went through a nice 1,200 foot lava tube called Subway Cave. Lava tubes are commonly formed in lava flows when a crust forms above a flowing river of magma just beneatht the surface. It's also common for lava tube ceilings to collapse. Since we couldn't get to Lava Beds National Monument without a very long detour, we decided to drive around Mount Shasta instead since we kept seeing peeks of it through the trees as we drove around in the area. Mount Shasta in Northern California is the second-largest volcano in the Cascades Range (only Mount Rainier in Washington is larger). 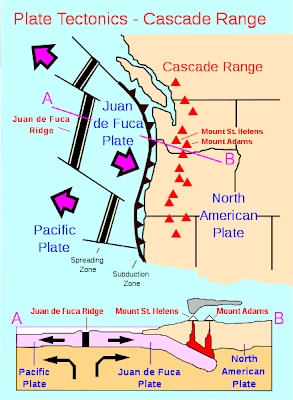 The Cascades is a range of volcanic peaks running from northern California up into British Columbia, Canada and formed by the subduction of the Juan de Fuca plate of seafloor crust under the North American continental crust. As the plate subducts, it causes periodic earthquakes and, when it reaches a deep-enough depth, begins to melt to provide magma for volcano formation. Some of the older folk reading this may remember the Mount St Helens eruption of May 18, 1980 in this range. Mount Shasta has erupted every 600-800 years on average and last erupted in 1786. It's interesting to drive through the many towns around the base of Shasta and wonder how they will fare when (not if) Shasta erupts again. 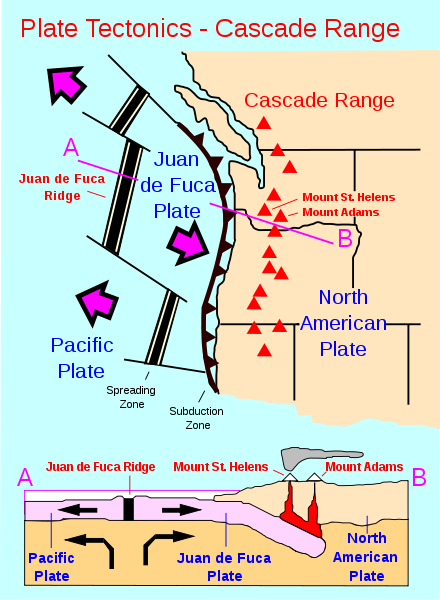 The Cascades volcanoes are not extinct, the subduction of the Juan de Fuca Plate is still generating magma - but rather dormant or sleeping until enough magma is generated to fuel an eruption. We did find a highway from the town of Shasta that led up to around 7,000 feet before the road was closed due to snow. That's about half-way up the 14,179 foot peak. Here's the view of the peak from the road. The end of the road was quite busy when we arrived on this Saturday afternoon. There were dozens of climbers around who had presumably returned from summitting (or attempting to summit). There was also a CHP helicopter taking off and about 10 official vehicles (Sherrif, Forest Service, and Search & Rescue) since a pair of climbers was hurt on the mountain and had to be medivaced off. A common occurrence from what I've read since the mountain is so accessible and some of the people attempting to climb it shouldn't. A final view from the north of this spectacular mountain. From Shasta we worked our way up I-5 to Grants Pass, OR where we're spending the night. Tomorrow is the Pacific Ocean and Highway 101. Today we took a roundabout way through Nevada. We started in Carlin, where we spent the night along Route 80, and then took I-80 for about an hour west to Battle Mountain. Then we drove south on NV-305 for 90 miles through absolute desolation following a basin south between two ranges. Then, crossing U.S. Route 50, the so-called Lonliest Road in America (it's not, we were on far lonelier roads in Nevada), we headed another 35 miles south on a dirt road and then took a Forest Service dirt road over a mountain range (it was actually snowing with temperatures in the 40's and the pass was over 7,000 feet in elevation - quite a change from 100+ temperatures in Moab a few days ago!). Our destination was the Berlin-Ichthyosaur State Park located in the middle of nowhere. Berlin was a mining town around the turn of the 19th-20th century and some 42,000 ounces of gold was taken from the local mine (as well as silver and mercury in the form of cinnebar). A few buildings stand including the mill. We were lucky to arrive when a volunteer was there who gave us a great tour of the mill, how the ore was extracted, and some of the buildings. Unfortunately, the mine is currently closed but is reputed to have 8 levels and 6 miles of tunnels. The other feature of the park are deposits of Triassic limestones which contain fossils of ichthyosaurs from when Nevada was the continental shelf of the supercontinent of Pangaea. Ichthyosaurs are marine reptiles that lived concurrently with the dinosaurs but looked very similar to modern-day dolphins. The ichthyosaurs found here are Shonisaurus popularis (named after the Shoshone Mountains) and some of the larger specimens were 50 feet long! We were fortunate to be the only ones there for a guided tour by the ranger of the fossils site with a number of ichthyosaurs in situ in the rock quarry. Interesting place. From the park, we worked our way to Reno and then north to the small town of Susanville, CA where we are spending the night at a very nice Super 8 (and $30 cheaper than the dump we stayed in last night). p.s. After trashing last night's Comfort Inn in Carlin, NV, I would like to put in a plug for a nice hotel. When in Moab for a few days we stayed at an independent hotel called the Bowen Motel. It was clean, had everything we needed, was in the middle of town, and was reasonably-priced. Highly recommended.